Adzes originally had bits made of jade or other hard stone. 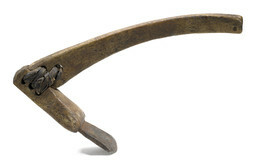 This 19th century example has an iron bit, bone socket, and caribou antler handle. The seal thong lashings were tied on wet, shrinking as they dried to make a tight fit.